TIFFANY CASSIDY (HOST): This is the story of a big effort to save a very small insect from extinction. CARY HAMEL: It’s easily one of the most endangered species on this planet. C-JAE BREITER: They’re basically tiny little green things on green grass and they’re incredibly difficult to find, even when you know where they’re supposed to be. TIFFANY CASSIDY: You’re listening to the Nature Talks: the Nature Conservancy of Canada Podcast. Fascinating stories about nature, why we need it in our lives, and the passionate Canadians helping to protect it. I’m Tiffany Cassidy. This is episode 6 – the Mystery of the Disappearing Butterfly. TIFFANY CASSIDY: I’m standing in Manitoba’s Tall Grass Prairie Preserve, about an hour southeast of Winnipeg. It's too early in the year to hear any birds. Snowbanks are under our feet. And it could be what's under the snowbanks that's interesting. I’m helping to look for evidence of a creature so elusive, it’s rarer than a giant panda! TIFFANY CASSIDY: I'm walking with Cary Hamell — a conservation director with the Nature Conservancy of Canada, the group caring for this tall grass prairie. And he spends more time than just about anyone else thinking about the Poweshiek skipperling. Never heard of it? No wonder…it’s a little butterfly, about the size of a dollar coin. It’s not flashy…dull brown on top, a little orange on the sides and fuzzy all over. But there fewer than 500 left in the world! And this is the Poweshiek’s last stand. CARY HAMEL: It’s just absolutely collapsed across its range. So much so that it’s left in only one spot in Canada — at the Tall Grass Prairie Preserve in Manitoba, and just a handful of sites in Michigan. TIFFANY CASSIDY: Cary is a butterfly detective. He’s overseeing a major research project to determine why the Poweshiek skipperling has disappeared dramatically in just the last two decades. CARY HAMEL: Is it a shifting climate that’s changing the habitat in the winter time? Is it new changes on the landscape, changing water flow, new chemicals being used? We’re not quite sure, but we’re working with a great team of people in Canada and the United States to work through these research questions, and we’re trying to quickly learn as fast as we can so we can save the species. TIFFANY CASSIDY: He means save it, before extinction. Cary’s struggling to discover more than just the basic facts. Like why does this highly endangered butterfly prefer this small plot right next to a major road? CARY HAMEL: At the Tall Grass Prairie Preserve there’s several thousand hectares of endangered tall grass prairie, but this butterfly’s using, like, one per cent of it. And why they’re not using the other 99 per cent, we do not know. Is it missing a key grass that they need in their life cycle? Is there not enough of the flower they like? Is there something going on with the water table? Snow depth? We don’t know. Lots of stuff to figure out. TIFFANY CASSIDY: Tall grass prairie is special. These seas of grass once flourished through central North America, from Texas to Manitoba. Landscapes, dominated by big bluestem and switch grass, standing as high as two metres. Today 99 per cent of Manitoba’s Tall Grass Prairie landscape is gone to development. And the Poweshiek skipperling has gone along with it. CARY HAMEL: Of all the grassland types in North America, it’s been the most affected. It’s got rich deep soils, great farmland, it’s where a lot of our food comes from. TIFFANY CASSIDY: The Nature Conservancy of Canada is working to protect tall grass prairie habitat in this corner of Manitoba. But it may not be enough for the Poweshiek skipperling. Even on conserved land, its behaviour is baffling. TIFFANY CASSIDY: Today we’re looking under the snowbanks for clues. The Poweshiek has a one-year life cycle. Caterpillars hibernate through the winter, hanging onto blades of grass buried under the snow. If the snow holds clues about the butterfly’s fate, Cary is determined to unlock them. CARY HAMEL: And it’s just trying to understand that winter environment, something that ecologists don’t think about a lot. It’s winter half the year in Manitoba. CARY HAMEL: So we’re in another Poweshiek skipperling site here. And what’s really neat about this site is it has multiple endangered species literally at our feet. It actually makes me a bit cautious even walking around. Dozens of species we don’t even know about yet that depend on the prairie. Snails and spiders and all kinds of cool things. So what we are really focusing on this butterfly and conserving it. It’s really a bit of an indicator for the overall health of the habitat. The fact that it’s still here is a good sign that this ecosystem is doing OK at this spot of the Tall Grass Prairie Preserve. TIFFANY CASSIDY: There are poles out in the field ahead of us. On top of the poles sit devices that record and collect the temperature and humidity readings under the snow. Cary heads out into the field to collect the data, watching his step. I stay put. TIFFANY CASSIDY: So I can’t squish caterpillars! TIFFANY CASSIDY: He walks just as carefully back, and reads his findings off his phone. CARY HAMEL: You can see graphed out over the last six months is the humidity and the temperature. Above the snow the humidity’s all over the place, from 30 per cent way down to low digits, temperature down to minus 40 Celsius and up to plus threes, plus fours during the winter. So a Poweshiek under the snow, really stable humidity, stable temperature, pretty warm. Exposed to the snow, quite a different story. TIFFANY CASSIDY: If they’re overwintering, that’s kind of what’s protecting them. CARY HAMEL: That’s our presumption. I wouldn’t. We don’t know about the species to fully understand what's key, what it really needs to survive, but we’re starting to gain a better understanding and this is just part of that. TIFFANY CASSIDY: But an important part. The clues Cary has collected are critical to the next phase of the plan to save the Poweshiek. Armed with his field research, a team in Winnipeg plans to give the little butterfly a boost in the lab. Something that’s never been tried before. That’s after the break. TIFFANY CASSIDY: The Nature Conservancy of Canada is a national charity. We protect important natural areas for the species that need them; species from Poweshiek skipperlings, to humans. Canada has plenty of other pollinators. How much do you know about them? Test your knowledge and learn more about this work at natureconservancy.ca/podcast. That’s conservancy. The website is nature c-o-n-s-e-r-v-a-n-c-y.ca. 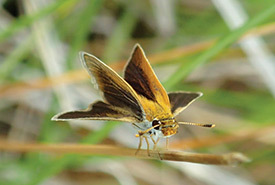 TIFFANY CASSIDY: The tiny Poweshiek skipperling needs help. Researchers in the field are racing to learn enough about the butterfly before it disappears altogether. Now, a team at Winnipeg’s Assiniboine Park Zoo, along with colleagues from the Minnesota Zoo, is trying a different approach: captive rearing. That means trying to raise the adult butterflies from eggs in a safe facility, And then releasing them into the wild. So I head to Winnipeg to meet the person leading the project. C-JAE BREITER: I’m C-Jae Breiter and I am the project manager for the grassland butterfly conservation program at Assiniboine Park Zoo. TIFFANY CASSIDY: C-Jae is keeping caterpillars in her freezer. TIFFANY CASSIDY: And this freezer is in a secure location facility — behind a locked door. C-JAE BREITER: So we’re just walking into a back area of the Leatherdale International Polar Bear Conservation Centre. And this is where we keep our incubator for overwintering butterflies. So in this freezer, before I open it, it has to stay at minus four degrees Celsius. So I’ll do a quick open. TIFFANY CASSIDY: I can’t see the caterpillars. They’re wrapped in paper towel and standing upright in small plastic cups. But I’m still one of the few people in the world to ever get this close. And then are just kept here in the dark until spring time. C-Jae doesn’t let the freezer stay open for long. She’s trying to mimic the temperature and humidity readings that Cary has recorded in field studies. Last summer, C-Jae and her team caught two female Poweshiek skipperlings at Nature Conservancy of Canada sites in Manitoba’s Tall Grass Prairie Preserve. The butterflies laid eggs in the facility, each about the size of a pinhead. C-Jae’s team released the butterflies back into the wild. Fifty-five eggs yielded six caterpillars. It was a project designed for the best chance of success. C-JAE BREITER: They’re basically tiny little green things on green grass, and they’re almost impossible to find, even when you know where they’re supposed to be. TIFFANY CASSIDY: In the wild, survival rates are thought to be very low. So low, that here in the lab an international panel of experts agreed that a three per cent survival rate in captivity would be considered a success. They will be thrilled if just two adult butterflies emerge, to be released this summer. It sounds low, but it’s an ambitious target to give the Poweshiek skipperlings a boost. And as the saying goes: failure isn’t really an option. C-JAE BREITER: It’s gotten so low that if we don’t do something now, basically they won’t be left on the landscape in a few years is the prediction. So we wanted to start working on it as soon as we could, to try and get the population kind of rebounding if possible. And also learning more about other grassland butterfly species at the same time, because most grassland species are experiencing the same population declines across their ranges. TIFFANY CASSIDY: C-Jae explains why it matters to study and protect a small, brown butterfly. TIFFANY CASSIDY: That’s why C-Jae is so passionate about her research. We still don’t know how successful this research will be. Will they meet that ambitious target of two butterflies surviving captive rearing? Back at the Tall Grass Prairie Preserve, Cary is preparing for further research and thinking about why this work matters. CARY HAMEL: All the parts of the ecosystem are potentially key. If we have a chance to conserve it, we have a duty to do that. But even if it does slip away, there’s a chance it will, it’s again one of the most endangered species on the planet. We’re hoping the lessons that we learn with this butterfly we can apply to some of the other species before it’s too late for them. TIFFANY CASSIDY: A few months later, I get a note from Manitoba: results are in for the captive rearing research and how many survived into adult butterflies. And it sounds like good news. So I ask Laura Burns to give me a call. Laura is now managing the zoo’s program. C-Jae’s away for a year to take care of a human baby. LAURA BURNS: Hi, it’s Laura. TIFFANY CASSIDY: Hi! So congratulations on all the butterflies. That’s so exciting! LAURA BURNS: It is really exciting! TIFFANY CASSIDY: So how many came out? TIFFANY CASSIDY: Wasn’t it two that was the goal? LAURA BURNS: Yeah. So yeah, we tripled our goal, which is really great, and this year we’re expanding so hopefully we’ll have more to release next year. TIFFANY CASSIDY: That’s so exciting! How did it feel to watch them? LAURA BURNS: It felt really surreal. There’s been two years of planning going into that moment, so it was kind of unreal that it was happening. It felt really good though too. And very…I don’t know…it felt…I’ve been working as a conservation biologist for a while, and it’s definitely one of the better moments of my career. You feel like you’re actually tangibly changing something and helping the ecosystem. TIFFANY CASSIDY: The Nature Conservancy of Canada does amazing things, like helping to protect species at risk of extinction. This work is only possible because generous people like you donate. If you would like to support this work, go to natureconservancy.ca/podcast and click on the big orange donate button. All amounts make a difference. TIFFANY CASSIDY: Like what you heard on our podcast? Subscribe to future episodes on your favorite app. Give us a tweet [BIRD SONG] using the hashtag #NatureTalksPodcast. Share it with a friend. Or email us at podcast@natureconservancy.ca. Are you looking to explore the amazing places we talk about in this podcast? Go to natureconservancy.ca/podcast to see our sites that you can visit. Next time, we’re going on a drive to find turtles. And we’ll meet a citizen scientist who’s part of the efforts to recover them from troubling low numbers in Quebec. Thanks to C-Jae Breiter, Laura Burns and their team for helping us to tell this story. Thanks to Cary Hamel for sharing his expertise, and everyone at the Nature Conservancy of Canada who put this together. And thanks to Pop Up Podcasting. Some of the birds you heard were from the Macaulay Library at the Cornell Lab of Ornithology from recordist Geoffrey A. Keller. Our banjo theme music is by Manitoba’s own Carly Dow. She helps protect habitat with the Nature Conservancy of Canada, and also creates great music. Find her at carlydowmusic.com. I’m Tiffany Cassidy. Thanks for listening.